I haven’t yet driven MG-223 that leaves Tupaciguara in the direction of Araguari at night without seeing a snake crossing the road. Here’s the most recent one I spotted, which I assume is a young rattlesnake. It’s small, maybe 6 inches or so, and it looks like it has a button at the end of its tail. My real dilemma when I spot one is whether or not to stop and risk getting hit by another vehicle. At any rate, I’m definitely in a hurry to get a photo and get back up to speed. 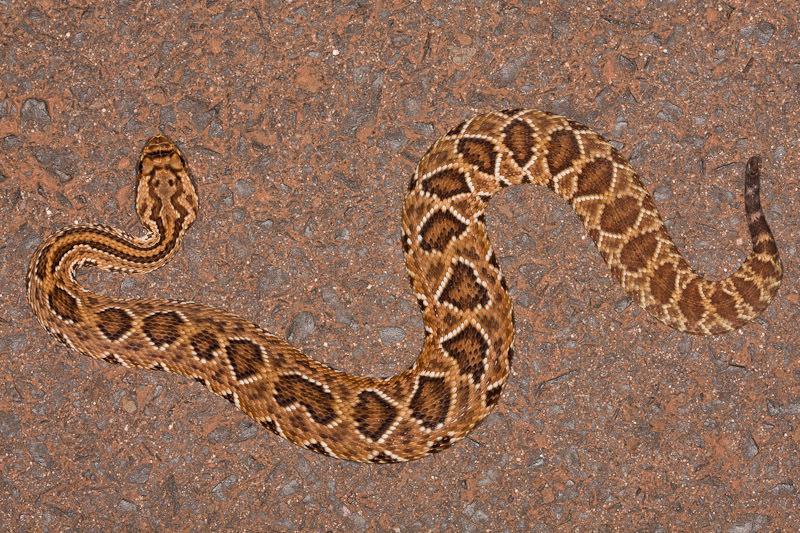 I think there is only one South American rattlesnake – Crotalus durissus. Highly variable, but the dark neck stripes seem to be characteristic. Thanks, Ted. Do you agree it’s a rattlesnake? I’m not absolutely sure, but it sure looks like it’s trying to develop a rattle. We don’t have rattlesnakes in my area, so I’m not that familiar with them. Yes, it sure looks like a rattlesnake to me. The button of a rattle is hard to see, but the dark neck stripes are characteristic for that species and seem to clinch it.